The Jason Will Real Estate Team tours hot selling condominiums in Orange Beach and Gulf Shores, to offer our clients first-hand expertise on the most sought after condo listings on the Alabama Gulf Coast real estate market. 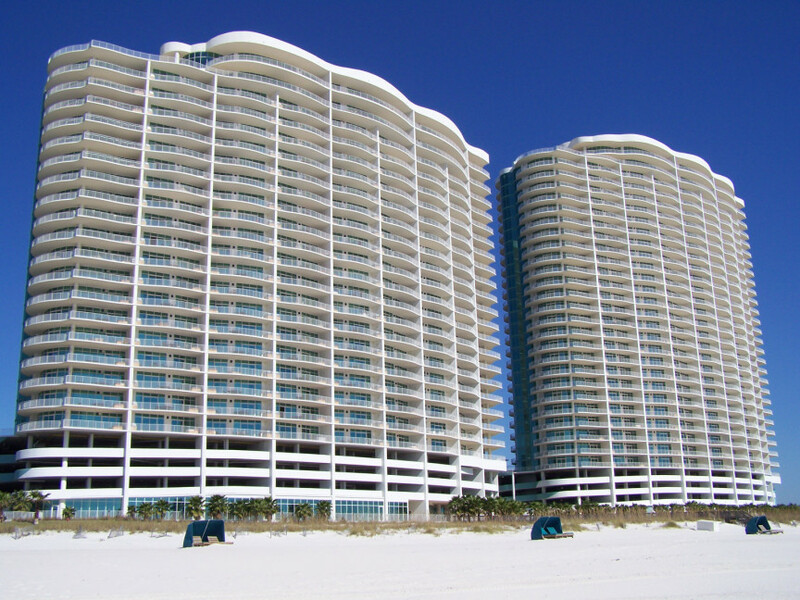 This week we toured Turquoise Place Resort Orange Beach Alabama. Turquoise is comprised of two breathtaking towers that stand 370 feet tall, with 400 total units. From the moment that we stepped into the lobby, the feeling of luxury was almost overwhelming. The mix of classic and modern style accompanied with all of the crystal, mirrors, and shades of blue, is really breathtaking. So what makes Turquoise Place Resort one of our hottest selling condo developments? How about a record sales year, with 52 units sold to date in 2012 and another 16 units currently pending sale. If those 16 pending units all make it to the closing table, that will put the 2012 numbers 20 sales ahead of the totals sales for 2011. This is in large part due to substantial closing credits that the are able to be past on to the buyer with the help of the financial assistance of BP, whose oil spill disaster has been credited for tanking the sales of many prominent condo complexes along our 32 miles of pristine gulf beach. In addition to substantial cost savings, luxury buyers are also able to seek financial assistance with the help of Regions Bank, a trusted local lender in the Gulf Region. One of the best features of the Turquoise Place Resort, is that despite the size, each unit has the look and feel of a penthouse. Gas fireplaces, ultra modern kitchens, gas grill and sink on the balcony and an outdoor hot tub come standard with all units. One of the things that the team found to be a pleasant surprise, was that not only was there a jetted tub in the master suite, but also in the guest bathroom. The comprehensive HOA fees also include natural gas usage and required maintenance on balcony hot tubs. The open floor plans allow for spacious and easy flow through the living spaces of each unit and there was never a moment where we felt cramped with seven of us on the tour of the model units. We viewed 3 and 4 bedroom units, as well as the penthouse suite. Although all of the units were spacious, we were a little surprised to see how small the master closet was in the 3 bedroom. The penthouse was very spacious with a chef’s kitchen and a huge media center. The master bathroom was luxurious and had a view to die for, but there was a lower deck from another unit that had wonderful views of the penthouse bathroom, leaving a slight privacy issue if left as-is. The penthouse offered a mother-in-law suite that featured a full bathroom, spacious closet and kitchenette. Although every deck comes with a gas grill, sink, and hot tub, it was rather limited on square footage. Also, many of the common areas seemed rather limited in size given the number of units. The majority of our team members were concerned with how crowded the pools and lazy river could be during peak holiday weekends. Overall, we were in awe of the grand architecture and luxurious property and unit amenities, that clearly set a new standard of excellence on the Alabama Gulf Coast. We were all starving after a busy morning of touring luxury condo units, so we stopped at the Cobalt, which is adjacent to the Caribe Resort in Orange Beach. Cobalt offers a wide variety of menu items, from delicious burgers to local seafood delicacies. The firecracker shrimp appetizer was the best balance of spicy and saucy, but I would stay away from the crab claws as they were far inferior. The grilled shrimp over white cheddar grits was amazing and just the right portion. A lot of the girls preferred the grilled fish sandwich which they claimed was tasty and had just the right amount of seasoning. 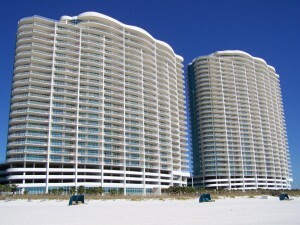 Tour Turquoise Place Resort condos for sale with the Jason Will Real Estate Team 251-866-6464.